A random post about seeing a Torte de Santiago in a local bakery led to a wonderful meeting with a new peregrino friend, Sherie from San Diego. We met at that local bakery while she was here in town visiting family. 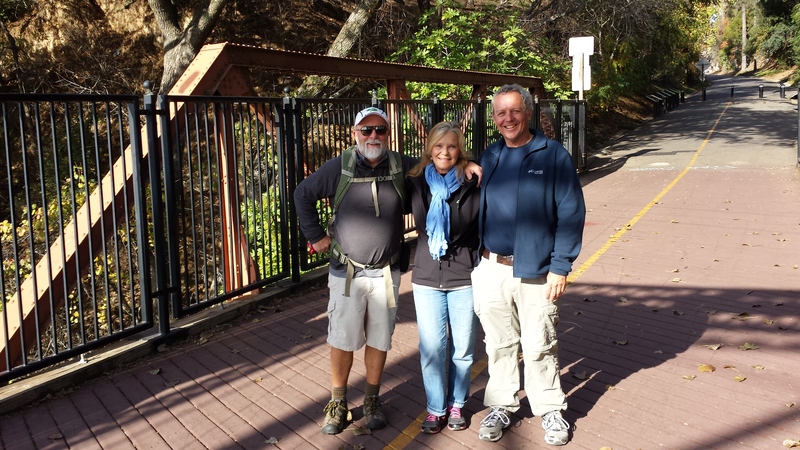 Greg and I took Sherie to our “training ground” down by the American River Trail and walked a short 3 miles to the Sunrise Bridge and back. This was so similar to the many encounters we had on the Camino while just walking along. Sherie told us of her last weekend, attending the “hospitalero” training in Los Gatos and how she was looking forward to getting an “assignment” to work in an albergue sometime soon. She also shared the sadness of losing a fellow pilgrim Jim to a stroke just the day before. On the old bridge back into town, we stopped a stranger and asked him to snap a pic of the three of us. Then we spent about five minutes telling him about the Camino, and he seemed interested in going! Haha. You just never know. When we returned to the bakery, there was only one thing to do. 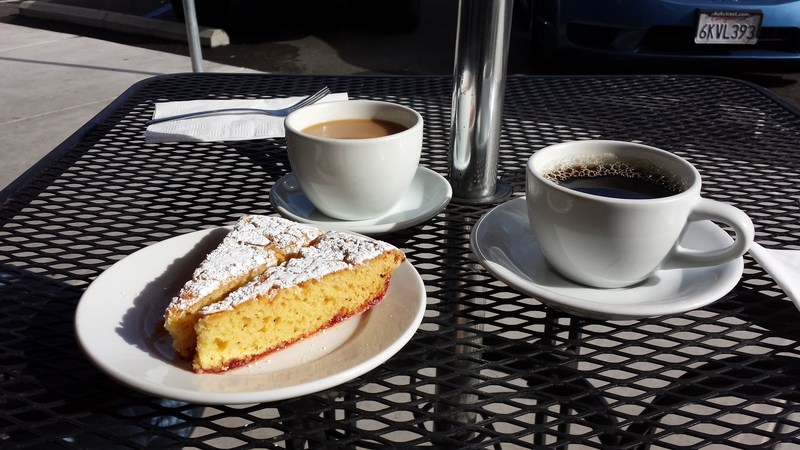 We had to sample the Torte, and that we did along with a delicious cup of coffee. More time for sharing our common experiences along the way followed, and it was a morning that filled me with great joy. Buen Camino, Sherie! I know we will stay in touch through APOC. Way to go! I walked the camino from St Jean to Santiago in Aug/Sept of 2012, when I was 73, and I wasn’t the oldest person there. I met several people in their eighties (or didn’t really meet them, for they went past me rather quickly). I’m hoping to return, but it seems that the camino is getting quite crowded and very much an in-thing. So much for quiet walking meditation. Still, it beckons.